On a simply perfect afternoon for cricket, Sussex brought their whole squad to Chichester to help celebrate the 100th anniversary of Priory Park being given to the people of the city. 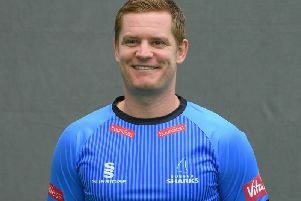 Sussex played a Twenty20 game against the Duke of Richmond's XI and in the interests of fairness, the county loaned a couple of their star players - and coach Jason Gillespie - to the Duke's team. It was the current Duke's grandfather who gifted the park to the city in 1918 and this was a lovely way to mark the centenary as a crowd of hundreds turned out for a rare very glimpse of professional Sussex cricketers this far west. One can only hope the wonderful public response to their visit will make Sussex think about coming to Chichester more often. The toss was won by Sussex skipper Ben Brown, who elected to bat then saw his team rack up 239-6 with Harry Finch hitting 57. In reply the Duke's team got off to a blistering start and Luke Wright's 85 off 29 balls put them in sight of victory before they scrambled to their target in the final over. There were sixes and fours galore in both innings as the crowd lapped up the action and local players from the Chichester and Goodwood clubs got their chance to face Sussex and play alongside the likes of Chris Jordan, Jofra Archer and Gillespie. The cricket match was part of a week of festivities marking Priory Park's 100 years belonging by the city.